figure 10.5 Wattson home energy monitor. In Stanley Kubrick’s 2001, the opening sequence shows an ape learning to use a bone to kill; the bone, thrown into the air, spins and cuts to an orbiting space station. The message is clear. Tools, or maybe weapons, define us as human beings, and the path from bone and shaped flint to spaceship is simply one of time. Alongside language use, which we shall discuss in Chapter 15, tool use and tool making are often seen as quintessential human activities. However, the story is both more complicated and more fascinating than a cut transition in a movie. In fact, though it is rare, a small variety of non-human animals do use objects as tools. For example, several kinds of bird either use a stone like a hammer to break a snail shell, or select an ‘anvil stone’ against which to smash the snail. Tool making is rarer still, but remember the chimpanzees in Chapter 4. They select a stick as they move though the forest, and later use it to extract termites from a log. This is more than tool making in response to an immediate need. The chimpanzees are choosing and modifying the sticks well before they encounter the termite site. Even chipped stone ‘axes’, the image that springs most readily to mind when thinking of human tool making, though exclusively hominid, are certainly not modern human. The earliest stone axes date back 2.5 million years when the early hominids who made them were nothing like modern Homo Sapiens, who only came onto the scene in the relatively recent 200,000 — 300,000 years. The actual purpose of early stone axes is unclear. Not suitably shaped for connecting to a shaft, they cannot have been thrown like a spear. Some think they were only used for scraping meat from carcasses, and indeed it is the evidence of cut-marks on ancient bones that helps identify them as human kill, or at least food. However, most stone axes are sharpened all the way round and many have a well-defined point, neither of which are necessary for a simple flesh scraper. One could imagine using them as hand-held hunting weapons, but this would require chasing the animal, leaping and catching it by hand while thumping it on the head with your stone axe — possible, but certainly risky with a large animal. The neurophysiologist William Calvin in his book “The Ascent of Mind” [Ca91] suggests an alternative: stone axes are, in fact, perfectly shaped to be thrown like a discus. He verified this idea by getting both expert discus throwers and ordinary students to throw replica axes. The axes behaved aerodynamically, rather like a frisbee, as they spun through the air, and then embedded themselves on their point as they landed. Calvin envisages early hominids throwing axes into the middle of a herd of animals at a water hole (where many axes are found). The axe would strike the back of an animal, and as it rolled across the skin the point would snag or stick into the flesh, causing pain. The aim would not be to kill the animal with the blow, but to cause it enough pain to stumble. As the herd stampeded away, the fallen animal might be trampled by its fellows, or at least left lying on the ground where it could be tackled by the band of hunters. co-opting and coordinating large areas of the brain to obtain accurate timing. Calvin suggests that these requirements for complex throwing not only drove the development of the brain, but furnished exactly the elements needed for complex cognition and language, and indeed laid the grounds for consciousness itself. Recall from Chapter 4 that it was this period in the midst of the Ice Ages, 50,000 — 70,000 years ago, when there was a step change in tool use from plain stone ‘axes’ to spears where a wooden shaft was tied onto a stone head. At the same time social changes are evident in the traces of settlements, and before long there are clear signs of cultural development with early art. We saw that Steven Mithen takes these developments as signs of the meeting of our different forms of specialised intelligence [Mi96], and we suggested that our multiple intelligences meet in both the logic of language and the pictures of imagination, the latter being needed to plan for future action. Calvin’s account of mental development is at present tentative, but both language and planning require just the kinds of sequential processing that he suggests were the outcome of tool use. While tool use may not be the sole prerogative of human intelligence, it may be its provenance. In Chapter 5 we discussed the important role of affordance. In particular we carefully distinguished the intrinsic affordances of an object or device from its perceived affordance. The former describe its action potential in relation to you, what you can do with it, whereas the latter is the way in which those potential actions are made manifest: visual, aural or other sensory appearance. However, as one digs deeper the story becomes a little more complex. Western visitors to Tokyo often report confusion when they try to navigate. The writing is so different that they cannot even match the names on maps with those on street signs. This is especially confusing on an underground train as the stops come and go faster than they can match the letters of the station names. The underground clearly affords travelling, in that it is physically possible to get on and off the trains, but at a practical level it only affords transport to those with some understanding of Japanese. Now imagine a person from 500 years ago suddenly deposited in the middle of a major present-day city. Does the underground system afford them transport? Similarly take a group of 21st-century design students and carry them back 200 years into a wheelwright’s workshop (Fig. 10.1 ). Around them are numerous specialist tools of the trade. Clearly for the 19th century wheelwright these tools afford the production of wooden wheels, but what about the time-travelling students? With the right knowledge and skills they could use these tools, but without such knowledge and skills the tools afford little more than holding and throwing. This is not just about sophisticated technology and tools. Going back 10,000 years, imagine you are looking at a wild boar moving through the woods. Does the boar ‘afford’ eating? Well, it does if you have stone axes tied to wooden shafts to make spears and are part of an organised social group that can hunt together. Recall that the term ‘affordance’ was coined as part of an ‘ecological’ approach to psychology, an approach that takes seriously the fact that we live and act in an particular environment. Our potential for action is relational: a fit between the properties of the things around us (rocky shelves or wild boars), our physical size and abilities, our own knowledge and understanding, the tools and artefacts we have to hand, and the social group within which we live. Only when the right combination of these occurs can we choose whether or not to act. Of course many of these things are dynamically changing over weeks, years and generations. At one extreme are the adaptations by natural selection that occur over many thousands or millions of years, so that our perceptions and abilities become well suited to the more slowly changing parts of our environment. However, humanity’s success in populating (and maybe destroying) the earth is less to do with our optimal fit for an environment – the ‘naked ape’ is not intrinsically suited for Arctic climes. Instead, it is our ability to adapt rapidly to changing situations and, in the longer term, to shape and change our environment, that makes us who we are. Imagine yourself in the wheelwright’s workshop 200 years ago. At first the tools and wood are a complete mystery, but after a while you may, through trial and error or reasoning, work out how to cut wood, shape it, join it. You build up knowledge over time through learning. A large stone may afford throwing to an adult but not a child, simply because of their physical maturity. Similarly the wheelwright’s tools may afford wheel making after intellectual maturation. But if instead you were an apprentice with the wheelwright, there would be more to the story. The accomplished wheelwright would teach you their methods and techniques, and after a long time, when you had learned yourself, you would teach the next apprentice. Perhaps as you saw carts from other areas or met fellow craftspeople you would learn their tricks and they would learn yours. Anthropologists talk about ‘communities of practice’: people engaged in related crafts or professions who share experience. Sometimes these are formal, like the medieval Craft Guilds; sometimes less so, like parents chatting at the school gate. These communities of practice both pass on existing knowledge across generations, and also share and generate new knowledge. Some of this knowledge may stay as ‘head knowledge’: techniques and methods of working transmitted orally or translated into written instructions, diagrams, or textbooks. This head knowledge is culture. However, sometimes this shared experience also leads to adaptations of the available tools, perhaps a special plane to make grooves of a particular shape, or pattern pieces for a different style of wheel. The wide variety of specialised tools in the nineteenth-century wheelwright’s shop is the end result of hundreds of years of culture embodied in physical artefacts (c.f. Chapter 6). It was never static, and even today master craftspeople pass on new ideas and create new tools and rigs for future generations. 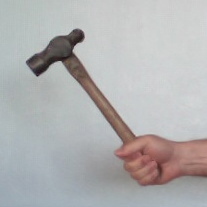 Heidegger’s concept of ‘ready-to-hand’ has been influential within HCI, and in particular his use of the hammer as an example. In Heidegger’s philosophy, ready-to-hand refers to the way in which a tool becomes invisible to you as you focus on the work to be done with it [He27;He62]. Think about eating soup with a spoon, or (the archetypal example) knocking in a nail with a hammer. You do not even consider the spoon unless something goes wrong, until you mislay it, or spill some soup. When all goes well you are ‘thrown’ or lost in the activity, the tools (spoon and bowl) ‘withdraw’ and become unnoticed in the act of eating. This is equally true of digital tools such as a word processor — do you think about the word processor or about writing a letter? Similarly when you get used to a digital device like a phone, you may dial a number without thinking “I’m using a phone”, or “I’m pressing the ‘7’ key”. If you do, the phone has become ‘ready-to-hand’. Heidegger deliberately does not talk about a single tool in isolation, but always within a collection of stuff or equipment that are being used to do something or achieve something. The spoon, bowl, table, and even the chair you sit on are all part of the equipment of soup eating. For the carpenter, hammer, nail, saw and plane are all at hand and used almost unconsciously. Instead, for him, the ready-to-hand is the primary way in which we experience these things. This is in fact intensely practical. Heidegger was trying to get inside the everydayness of human experience and uncover a way of seeing the world that takes the mundane seriously as a start point. Normally you do not spend time contemplating a spoon or bowl, you just reach for them and use them; their primary mode of being for us is when they are ready-to-hand. Of course, this ‘thrownness’, being able to act without thinking about the tools, is not our perpetual state; things are not always ‘ready-to-hand’. Bleary-eyed in the morning, you reach into the cutlery tray to get a spoon to eat your cereal, but you forgot to wash up and there is no clean spoon; you start to swing a hammer but then stop as you can feel that the head is loose on the shaft; you hear the sound of your mobile phone ringing but fumble because it is in a zipped pocket and the zip is hard to open. At these times you have to start looking at the tools as separate things. You only think about the spoon when it is not in the drawer, you think about the hammer because it is broken. This shift of focus from the task at hand to the tools in hand is often called ‘breakdown’. When the tool is unusable for some reason, such as being broken like the hammer with the loose head. Heidegger says it becomes conspicuous. When the right tool is absent, like the missing breakfast spoon. In this case Heidegger says it is obtrusive. When something stands in the way, such as the zipper when you are after the phone. Heidegger calls this obstinacy. In all these cases, instead of having something ready-to-hand, it is only present-to-hand: there, but merely in the sense of being something about which we can think and ponder its attributes. We are no longer simply doing something, but instead have had to start considering how to do it or what to do. However, these immediate causes of breakdown need not lead to a complete break in the flow of work. The missing spoon does not lead to an intense philosophical contemplation of spoon-ness. Often we can equally quickly recover from the breakdown; we pick up a screwdriver, realise it is the wrong size and instantly reach for a different one. Only when there is a continued failure of these semi-automatic recovery mechanisms do we start to really consider what to do next, what Heidegger calls circumspection, casting our eye around and realising for the first time the equipment that lies around us, which we have been using all the time yet have hardly noticed. The idea of being ready-to-hand is sometimes confused with what are often called ‘walk-up-and-use’ systems, such as tourist information points or bank cash machines. These devices are designed for public use, and should, to an extent, be accessible without depending on prior knowledge (or at least only on generic knowledge and skills). However, to be ‘ready to hand’ in the way Heidegger describes typically requires familiarity with the equipment and practice in its use. The hammer is a prime example of this. Even how to hold it properly is not obvious: look at this picture. But no, that is not the way to hold a hammer! If you try to use it like this you end up using the strength of your arm to knock in the nail, and not the weight of the hammer. In fact this is quite sensible for a child, as a ‘proper’ grip would put too much strain on their wrist. Recall that Gibson’s definition of affordance was relational, about the ecological fit between the object and the potential actions, and the actions depends on who is doing the acting. 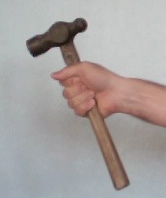 For a small child with weaker arms the hammer probably only affords use at all with this grip. The first of these is closely related to issues we have previously discussed: anything that makes a device easy and obvious to use, for example perceived affordances so we can immediately see or feel how to use the thing. It is most obvious when we test a device’s usability, and it is what we are most likely to notice when choosing a product to buy. However, note that it is easy to focus on the very first use of the device, and forget the importance of long-term practised use. This said, it is the second challenge, designing for when things go wrong, which is most often neglected, yet has the greatest influence on long-term usability. When you try something out, or demonstrate its use, the tendency is to show what happens when it is working. Even testing with users is focused on minimising the number of mistakes. However, day-to-day life is full of stumbling and fumbling, things not quite in the right place, the unexpected and malfunctioning. Yet somehow we usually muddle through without serious disquiet. Physical tools and objects have particular qualities that ease repair from breakdown, qualities that may be missing from digital devices unless we take care. Recall in Chapter 7 that physical things exhibit a visibility of state and locality of effect. These make it easy to detect that something is wrong, and early detection of failure is critical to ease of repair. In devices with digital functionality, we saw that there is less visibility and less locality, so it may not be obvious until much later that things have gone wrong. If you are hand-washing clothes and heat the water too much, you are likely to notice from the steam rising, or feel the heat as soon as you put your hands in. But if you select the wrong temperature setting on a washing machine, you will only notice an hour or so later when your favourite jumper comes out several sizes smaller than when it went in. This can happen with more complex physical artefacts also. Imagine putting together a kit-pack wardrobe. You choose the wrong screw and it is slightly too big for the hole. You notice immediately and reach for another of the right size: minor breakdown and fluid recovery. Now imagine that early in the construction you chose a screw that was slightly too short. It fitted in the hole and you proceeded without noticing. Only at the end do you discover the sole remaining screw is too long for the last hole. Now you have to problem-solve, work out what is wrong, perhaps deconstruct the wardrobe until you find the other screw, or look for a drill to make the hole bigger. Knowing that digital devices often lack visibility and locality means we can look for ways to ‘put back’ these aspects of physicality. This includes taking into account the different feedback loops discussed in the last chapter, and might involve redesigning physical or digital aspects of the device. As an example, consider the problem of designing a remote control for a DVD player. The control typically has no display (no visibility of state), so the feedback is on the player, not the controller (spatial non-locality). Worse still, some operations, such as starting to power up the motor that spins the DVD, take time (temporal non-locality). There will also typically be multiple other connected devices with their own controllers. It may be confusing which controller is which (poor mapping), and furthermore if the television has multiple inputs the output of the DVD may not be visible (no visibility of state). You pick up the remote and press a button, but nothing happens: is it just a delay, is something blocking the infra-red signal, did you press hard enough, is the TV on the wrong source, or are you just holding the controller the wrong way round? To tackle some of these problems we might consider additional visual feedback, perhaps a little screen on the device, or a light on the player that flashes when it detects the controller. We might use vibro-tactile feedback, maybe a small vibration while it is communicating with the player and a sharp ‘kick’ if communication fails. Alternatively, or in addition, we may change the physical design of the controller. For the issue of ‘which device is which’ we could simply design the player and controller with similar distinctive styling so they are obviously related; we could help orient the device by making the shape fall more easily into the hand in the right direction. Interestingly, adding the small screen on the controller would have the side-effect of making the orientation clear irrespective of whether it works! Having detected that something is wrong, you still need to repair it. Visibility is often useful here also, as it makes it easier to work out how to fix a problem. However, the level of visibility required for repair is greater than for ‘normal operation’. With the hammer, if the head becomes loose you can easily see this and work out how to fix it, perhaps by banging the hammer head further up the shaft or adding a small wedge. However, when the wireless network fails on your iPhone how do you work out what to do? With physical tools we can often obtain successive levels of information by simply paying attention to aspects we normally ignore (for example looking at the way the hammer head is attached to the shaft). With digital devices we may need to add means to reveal this explicitly (for example signal bars on a phone or trouble shooting modes). The other barrier to easy repair is lack of proportionality. Recall that with physical things it is most often the case that small efforts create small effects, so if you make a small mistake only a small correction is needed. However, non-proportional effects may mean that your small slip is hard to fix. Desktop systems often deal with this by including an ‘undo’ button, but with physical objects we ‘undo’ by doing something else. This is why the ‘natural inverse’ discussed in the last chapter is so powerful. Whether the effect was small or large, controls with a natural inverse mean that you are able to fix mistakes, and often do so without noticing. Perhaps most important, the natural inverse means you make the right correction; if there is one thing worse than the mess caused by a mistake it is the mess caused by a botched attempt to fix it! Not everything can be reversible, you can move flour back and forth between the bag and the scale pan, but not unbake a cake. The skilled tool-user has an awareness of reversible and non-reversible actions: positioning pieces of wood with a slow-setting glue vs. sawing a plank in half. However, with digital devices this may not be so obvious. Again, skilled users develop knowledge and awareness of dangerous actions. For example, some users of the database query language SQL, knowing how dangerous ‘DELETE’ can be, may type ‘WHERE id=37’ and then backspace and insert ‘DELETE FROM my_database’, to prevent the potential problem of accidentally deleting everything by omitting the ‘WHERE’ clause. Good design can make it easier to avoid irreversible unwanted actions. This can be achieved digitally, for example adding confirmation dialogues like “are you sure?”, though of course too many of these and we start to always click “yes” without thinking! Physical design can also help: recessed buttons, colour coding, or flaps over dangerous controls as in the big red ‘fire’ button in action films, or clamshell phones. Consider again the two switches in Figure 9.15: there is another important difference apart from their visibility of state. The dishwasher button sticks out proud of the surface of the control panel when it is off while the TV on/off button is flush with the surface of the TV. The dishwasher is in a kitchen at hip level where it is constantly brushed as one moves past or reaches across the worktop. Not infrequently the button is pressed ‘on’ by accident. This has the effect of spraying the dishes with cold water as a pre-rinse wash starts up. That’s very annoying when the dishes have already been washed, and if not noticed immediately means they get washed again, at financial and environmental cost. If anything, it is the dishwasher that should have its button either flush or recessed to prevent accidents. Small differences in physical design can make a big difference in life. It is easy to become so concerned about avoiding breakdown that the positive aspects can be missed. Heidegger talks about the state that follows a breakdown which has not been instantly corrected. Rather than being ready-to-hand, part of your ongoing action, the tools around become purely present-to-hand, objects for inspection. However, the term he uses for this state is the circumspection: a casting around of the eye, seeing the multifarious equipment for the job scattered round, almost as if for the first time. Note how this state is still immersed in action, in the job at hand. It is not the speculation of the scientist looking abstractly at things in isolation, from the outside, as we often are in writing a book like this, but rather this circumspection has the actor and the activity still at its centre. It is a consideration focused on the needs of action. Of course, you really want to get the job done, be it writing a book, making a cup of tea or simply turning on the TV, so these breakdowns are an intrusion into everyday activity. However, they also offer an opportunity to reflect upon this everyday-ness, the tools we are using and the activities we are doing. We might realise that we really need a new hammer, or that there is a better way of joining wood. Continual breakdown is bad, but occasional breakdowns are precisely what drive the cultural learning loops we discussed earlier in this chapter. knowing-in-action — The clear knowledge, based on experience, that is there whether one is hammering in a nail, or sketching the design for a new bridge, but which is not explicit and may be hard to verbalise even when asked. This corresponds closely to ‘thrownness’, which Heidegger describes as when we are engaged in our everyday activity. reflection-in-action — The reflection that we undertake while in the middle of an activity, often when we encounter breakdowns, similar to Heidegger’s circumspection. The goal of such reflection is still job-focused, but by stepping back and out of the immediate task at hand often enables a fresh perspective and new way of tackling a problem that has become stuck. reflection-on-action — The thinking after the event, going back over the decisions made, pondering the general lessons or novel solutions found, and reflecting too upon the processes we use, including the processes used during reflection-in-action. These form a ladder of reflection where one can reflect on one’s actions, one’s process of reflection, and in a way Schön’s own reflection is a very high-level reflection on the whole ladder. However, like Heidegger’s circumspection, these levels of reflection are not divorced from praxis, but are both based on experience and subject to frequent experimentation, trying out ideas, grounding ideas in action. Schön studied a variety of professionals, but particularly those involved in various aspects of design. For a designer, reflection is particularly important as it is this that allows new solutions. Often it is sufficient that a designer comes to a situation from the outside. You may have had the experience where a visitor asks a question about something in your neighbourhood or home and you step back, having never noticed it even though you have lived there for years. Of course, it is precisely because you have lived there for years and seen it every day that it is invisible to you. Our senses are tuned to ignore the familiar and so it is only the stranger who notices the things that are there all along. It is often designing for a familiar environment that is hardest, as here one has to find ways of estrangement such as Garfinkel’s breaching experiments (see Chapter 1), designed to make the everyday rules of life obvious [Ga67]. Of course, to even do this one has to be aware enough of the rules to deliberately contravene them! Experienced analysts may learn over time to look askance, to take the child’s eye, and see the strange in the familiar, but that is a hard and long lesson — one that both expert ethnographers and comedians learn. Estrangement can sometimes be aided by systematic actions: cataloguing everything. Every activity during the day, every object on a desk, items used daily, or infrequently, the unusual and the normal all become equal on the list. It is often surprising what you notice in a photograph that was not apparent when taking it, especially if you point the camera in an unusual direction. Counter tourism involves doing the opposite of what a tourist would normally do, going to the places the guidebook tells you to ignore [LP10]. In particular some counter tourists will deliberately visit a famous place and then turn their back on it and take a photograph in the opposite direction. Looking at the unexpected, sideways, backwards, it is amazing what you see. 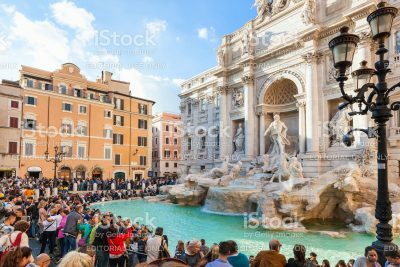 Fontana di Trevi is in every guidebook, splendid, glorious, and actually bigger than it looks in pictures. 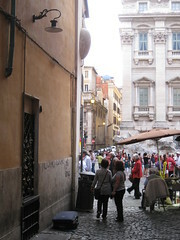 The small square containing the fountain is always awash with people. 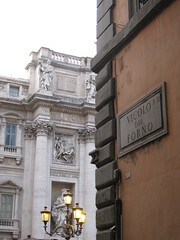 However, face away from the statues, the flowing water, the postcard and trinket sellers, and way to your right is a tiny alleyway, Vicolo del Forno. It is too small to be named on most maps; it goes nowhere. The narrow opening, part-shielded by the roast-chestnut seller, cuts out much of the noise, and its unprepossessing appearance puts off many visitors. But a short way within is a small side window to a shop, covered with wrought iron crossbars from the days before toughened glass and security alarms. 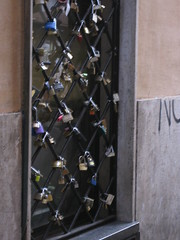 On each bar there are tiny padlocks, and on the padlocks more padlocks, tumbling from one another, like rock plants growing from walls. 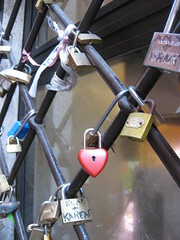 Each padlock has names written on it, love trysts [Dx10]. Reflection is not just for designers. We may want ordinary users to pause and reflect too: on their health, on their neighbourhood, on the environment, or just on life. As well as designing to avoid breakdown, we may sometimes design artefacts that deliberately encourage breakdown. In interaction design one is usually designing things to make them invisible, transparent, offering clear messages in the user’s own language. However, Bill Gaver and colleagues turn this on its head and instead embrace ambiguity as a positive design value, creating pieces that provoke insight rather than provide information [GB03]. One example is the “Sloganbench”, situated in a Dutch housing estate as part of a project to increase the presence of older people in the community [GD99]. The bench has a display built into the back, using electronically controlled fabric scrolls, as found in advertising billboards. But here, instead of slick messages encouraging you to buy toothpaste, are slogans hand-written by older members of the community, capturing aspects of their feelings towards the estate. There is no explanation, no statement of purpose, nor brass plaque. Instead, those walking by or sitting on the bench are invited to create their own interpretations. At a more prosaic level, pedometers, diet notebooks, and devices to monitor heartbeat are designed precisely to take you out of the activity of walking, eating or exercising, to think about the activity and its implications for your health and wellbeing. Even a Twitter-enabled mobile phone, by encouraging you to tell others about what you are doing also encourages you to notice. With electronic monitoring of temperature, electricity use and other aspects of the home, it is becoming easier to provide a day by day and even moment by moment carbon footprint. Most current energy meters use standard LCD displays or pass data direct to your computer, although some attempt to be decorative so that you actually look at them. However, it is possible to consider physically engaging devices such as a water column at the front door that shows the 50-year sea-level rise if the world consumes as you did that day. Fig. 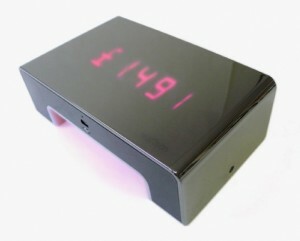 10.5 Wattson home energy monitor.